My father is the perfect man to play Santa. He’s got the big, white beard, a well-cultivated beer belly (he’s a Yuengling man, if you’re buying! ), and a jolly Germanic red nose. He looks so much like Santa, in fact, that my friends in high school would call him that even in the heat of summer. 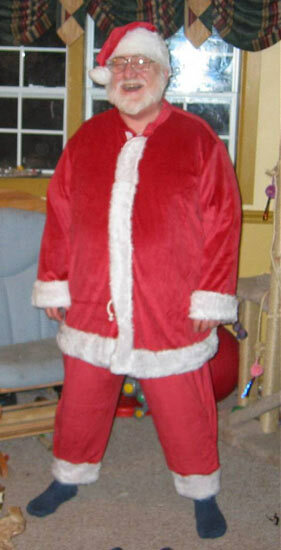 So it was a crime against Christmas that he didn’t actually own a Santa costume, especially since my brother’s kids are now at the perfect age for a “visit from Santa”. So I took it upon myself to correct this, and armed with Mccalls 8992, some red velour from the Utrecht fabric market (which may look familiar to you! ), and some white fun fur, I made him a costume fit for a Santa professional. For those of you thinking about this pattern for your own “natural” Santa, don’t be put off by the quite small measurements on the pattern envelope – the finished garment size is plenty big enough to fit over a natural beer belly, even though Mccall’s don’t bother to actually print the finished sizes anywhere, grrr. (For the record, the X-Large shirt measures 65 inches around at the widest part, and the trousers measure 54 inches at the waist/hip, with an inseam of 24 inches and outer leg length of 37 inches before hemming). I kept pretty true to the pattern, except I added the white band to the bottom of the trousers since we were purchasing the black boots and belt separately, I omitted making the fun fur beard (for obvious reasons), and I used strips of sew-on velcros instead of dots so he could get a better fit without a single fitting (we live an ocean away!). It arrived intact, fits perfectly, and he’s already got several parties planned even before his grandchildren get their own personal audience! Separator image Posted in Gallery and tagged with costume, menswear, xmas.